Price: £3 including P&P by mail order, or �2 from her stand at events. Availability: Purchase at the Evelyn Hewett's personal website (email her to order). The scripting of this comic is on the whole very good. There is a definite start and end, which is actually a to be continued which is promising. The narration helps drive the story onwards in an interesting fashion and most importantly character development shows a great deal of promise for the main characters, fine for a one-shot or short story. I'm hoping to see more characters in future issues however. There are areas where the artwork looks a little rough, evidence of sketch work and perspective lines still visible. Other than this the scenes look solid and believable accompanied by some well thought out page layouts, I genuinely like them and think they only help the story along. I'm happy to say that this artist draws cars rather well, something I'm usually disappointed by with other artists, even professional comic artists often neglect little touches like this. The most impressive feature art wise I can see are the action shots. This is not an action comic by any means but nevertheless the action shots are conducted in a fluid and believable manner. Evelyn seems to have a flair for rendering action. 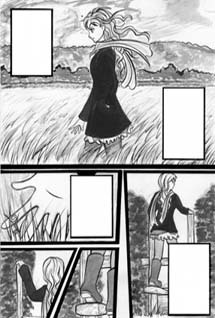 For a first comic by a teenager it's a good start, I hope she carries on as she has begun. 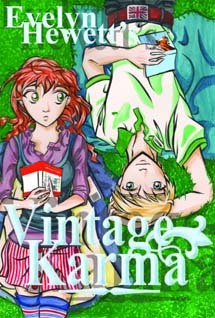 I'm looking forward to reviewing the next Vinatage Karma. ALL IMAGES COURTESY OF EVELYN HEWETT.